Not to be confused with King Calamari. King Kaliente is a boss in Super Mario Galaxy and Super Mario Galaxy 2. He is an octopus who seems to be in league with Bowser, as he leads a portion of his fleet; and is called upon by Bowser Jr. to fight Mario, and guards a Grand Star. He is fought twice: once in the Good Egg Galaxy and again in Bowser Jr.'s Lava Reactor. The first battle is for a Power Star and the second battle is for a Grand Star. His name comes from the Spanish word caliente, which means "hot". King Kaliente, after Mario knocks his crown off. This can be done by hitting him twice in a row with Coconuts. After Mario lands on the Magma Planet in the Good Egg Galaxy, a yellow Luma will warn him about the king. When Mario reaches the volcanic side, the king will emerge from the lava pool and shake his head, angered that Mario has awakened him, beginning the battle. He will first spit out three fireballs, followed by a coconut. Mario must perform a Spin or a Spin Jump to whack the coconut back at him, which stuns him, and Star Bits will emerge. The King will again shoot out three fireballs and then a coconut, which Mario can spin back at him, which will make the King throw it back at Mario. If Mario whacks it at him again without the coconut flying past him, he will knock the king's crown off. If it is missed, the attack pattern will repeat until Mario is successful. King Kaliente will get very angry after his crown falls and sinks into the lava, and unleashes a big roar of wind, blowing the lava around and sprouting small Lava Bubbles that will bounce on the lava or on the ground toward Mario for the rest of the battle. If they touch Mario, they will burn him and cause him to lose up to two HP. Again, the King must be hit three more times in a row with a coconut. If this is pulled off, King Kaliente will be knocked out and will collapse back into the lava pool. A Power Star will sprout out of the lava and appear next to Mario, and the Lava Bubbles will vanish. King Kaliente is fought for a second time in Bowser Jr.'s Lava Reactor. His tactic is the same as in the Good Egg Galaxy, but the fight itself is much harder. The fight takes place on a ring of small platforms that will sink into the lava if Mario stands on them for too long. King Kaliente's attacks are also much more frequent, and include sending in dozens of Lava Bubbles, taking an additional shot in the first and second hits, and after having his crown knocked off, summoning fiery meteors from the sky or spitting them out. After Mario defeats him for the second time, he will give up a Grand Star. He also has a dark, "scorched" orange-brown color, possibly from the last fight. King Kaliente makes a return appearance in Super Mario Galaxy 2's Boss Blitz Galaxy, with several other bosses from the first game. He's the second boss Mario fights. His appearance and attack methods are identical to Mario's first encounter with him in the Good Egg Galaxy and Mario also defeats him using the same method as well. When King Kaliente is beaten, Mario can access a Launch Star that blasts him to the next planet. Another boss in the game, Prince Pikante, bears a strong resemblance to King Kaliente, who is implied to be his father due to their names and designs. 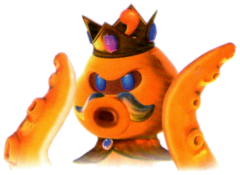 Artwork of a burnt King Kaliente, as seen in "King Kaliente's Spicy Return"
King Kaliente is best described as a giant octopus. Unlike most of the game's octopuses, he resembles a real-life octopus due to his long suction cupped arms, just like a real octopus's arms. His skin is orange and his eyes are blue. He has a crown on his head, a small red cape tied around his neck with a jeweled brooch, and a white mustache above his nozzle-like mouth. A small antenna topped with a red orb emerges from the top of his head, just barely visible above his crown. When he is battled a second time, his whole body has a much darker, blacker hue and his eyes are red. French Poulpoboss From "poulpe" (octopus) and "boss"
King Kaliente shares his boss music with Bugaboom and Topmaniac. If the player long jumps to King Kaliente during the battle, King Kaliente will knock the player back like he does when deflecting a coconut. King Kaliente is the only boss that guards both a Power Star and a Grand Star, and also the only boss who is fought in a regular galaxy (Good Egg Galaxy) and a boss galaxy (Bowser Jr.'s Lava Reactor). It appears the player was originally able to "swipe" the fireballs away using the Star Pointer, as seen at the end of the E3 2006 trailer. This page was last edited on March 21, 2019, at 14:04.